Have you also been wondering what to do with all of your shoes? It took me a few years of having shoes all over the place or ugly shoe shelves against my walls to realize this! Cubes make for great shoe racks. You can pick multiple divider sizes or bins if you want the shoes completely tucked away. I chose to use one half divider and one quarter divider since my shoes are smaller than Nick’s. We have our main shoes facing out as pictured above. Shoes we don’t wear as often are to the side in another set of cubes. 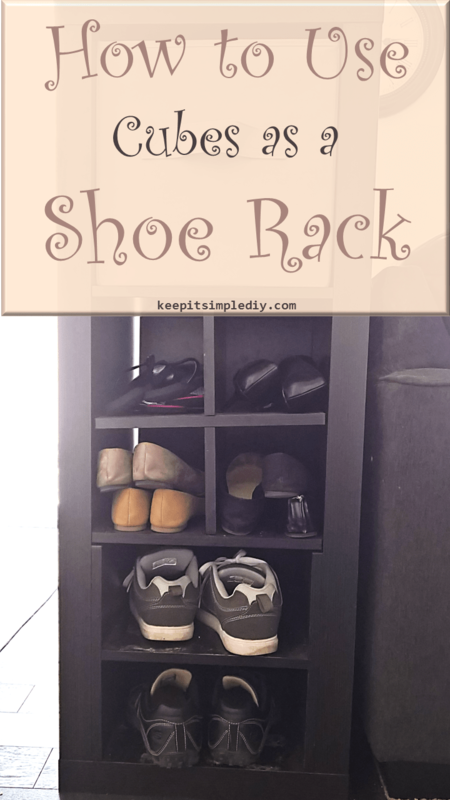 Do you have any different type of storage that you use for your shoes? Let me know! I’m always looking for new ideas because even though the cubes look cool, they can be a little clunky. Here are the pieces I use. I use all espresso for the cubes I have but in the new house I’m going to switch to the weathered look. It’s so hard to find a place for all my shoes! Great idea and stay up and out of the way but you can still see them. This idea is great! Definitely would take less space than using a regular rack! Love your idea. My husband just built me some storage for my shoes. I never seem to have enough.